Enjoy maximum savings and flexibility in Miami, Key West, Fort Lauderdale and more with the Miami and the Keys Explorer Pass. Create your own sightseeing itinerary and gain admission to your choice of three, four or five popular attractions and activities. Perhaps visit Miami Seaquarium or Jungle Island; take a duck tour of South Beach; rent a kayak or paddleboard in Key West; or hop on and off a double-decker Miami sightseeing bus — you can choose from a list of 30 attractions, and you have 30 days to use your pass once activated. Enjoy direct entry to attractions. Simply download your pass on your mobile device and go – no voucher redemption required! 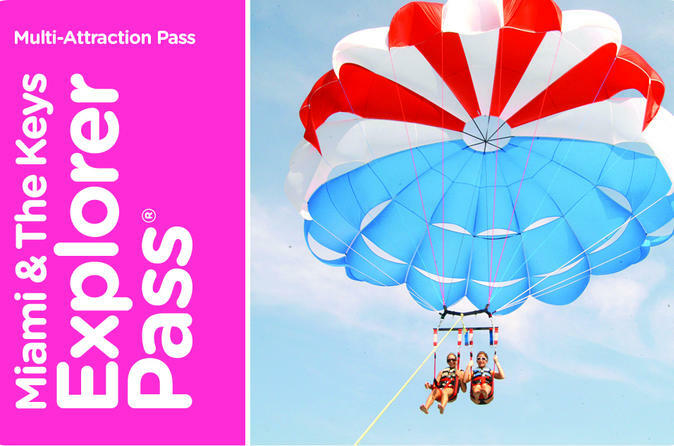 You have 30 days from the first use of your Miami and the Keys Explorer Pass to enjoy your choice of three, four or five attractions and activities (depending on the option you purchase), all for one low price. There are more than 30 popular options you can choose from in and around Miami, South Beach, Fort Lauderdale and Key West, and all are listed in your complimentary pocket guidebook to make it easy for you to decide what interests you most. Redemption is easy and allows you to avoid wasting time in ticket lines — once you've received your pass, just tap or scan your mobile device at designated ticketing areas. Special Offer - Save up to 45% on attraction admissions by booking this pass with us! - Book Now!